On Sunday I went down to Gamla Stan and spent some time with Lisa 2. We lounged by the lakeside with a view of the city hall, and watched people and boats pass by while we chatted. After a while, we walked up to Järntorget and had a cup of coffe at Sundberg's Café. The sun was shining, and I captured some fun photos of Lisa as she tried to hide from the camera. After finishing our coffee, we walked across the bridge to Södermalm with the intention of going up the the walkway atop the cliffs overlooking Södermälarstrand. However, Lisa realized that she needed to run some errands, so we went shopping instead. I had been expecting to go climbing later in the afternoon with Åsa R., so I had a backpack full of climbing gear with me. I must have looked like a real tourist walking down Götgatan with a giant backpack on my back. A while later, Åsa called and said she wouldn't be able to come climbing. So I had lugged 15 kg around the whole city for naught. Oh well, I guess at least I got some exercise. With climbing off the agenda, I was free to hang out with Lisa a while longer. Once Lisa had bought the items she needed, we walked down to Skanstull and then continued down to the dock by the water where I had gone swimming with Linnea & Kamilla a couple of weeks ago. _MAL0856.jpg, originally uploaded by Michael A. Lowry. The rain began to fall just as we sat down by the water's edge, so there was no swimming this day. 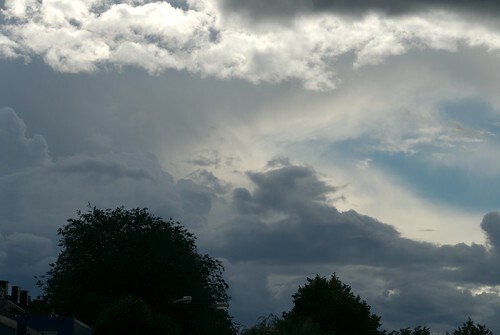 The storm clouds did look impressive though, so I snapped a photo. I posted a total of seven photos from the afternoon.